Brian Viloria (29-3-0, 16 KOs) will defends his World Boxing Organization (WBO) flyweight title for the very first time against Giovanni Segura (28-1-1, 24 KOs) of Mexico on December 11, 2011 at the Yñares Gym, antipolo city at 9:00 am. The supporting main event for the Viloria-Segura flyweight blockbuster bout will feature veteran Martin Honorio (31-6-1, 16 KOs) of Mexico versus Fahsai Sakkreerin (36-2-0, 20 KOs) of Thailand for the IBF interim Super Featherweight title. The undercard includes Al Sabaupan (17-0-1, 12 KOs) of Philippines vs. Roy Muklis (23-3-2, 18 KOs) of Indonesia for the IBF Pan Pacific championship. Also, Lolito Sonsona (17-0-1, 12 KOs) will meet former world title challenger Arden Diale (16-6-3, 4 KOs) for the Philippine Flyweight Championship. 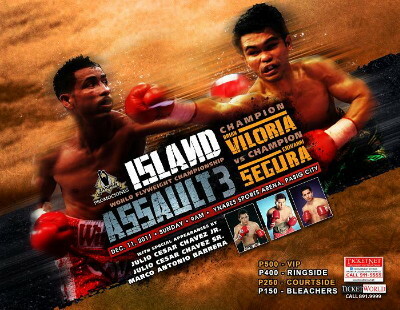 Island Assault 3: Champion VS Champion tickets are available through Ticket Net (SM outlets) and TicketWorld—VIP: Php 500, Ringside: Php 400, Courtside: Php 250, Bleachers: Php 150. For more information visit www.solarsports.ph.